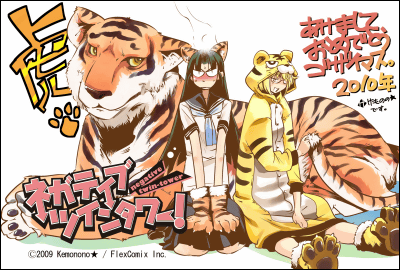 FlexComix Blood focusing on shonen manga, FlexComix Flare of shojo and FlexComix Next of seinen are free webcomic magazines run by Flex Comix. Although web manga has yet to reach the status of printed manga, the FlexComix lineups have been quite successful, with some titles adapted to anime. 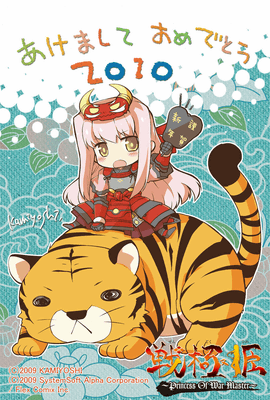 Now they're offering free nengajo(New Year's card, a custom in Japan similar to the Western custom of sending Christmas cards) of each titles. There are more than thirty New Year's Cards on offer, each in high resolution(mostly 1378×2039). Free for non-commercial use so you can print them, send them to your friends or pick your favourite and make it your wallpaper. Here are some examples. Negative Twin Tower! 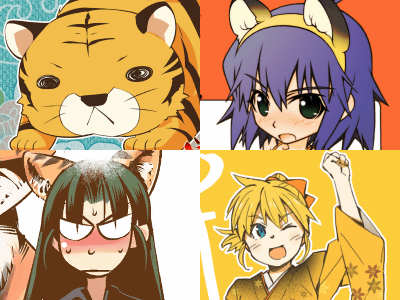 by Kemonono. 2010 is the Year of the Tiger so many of the New Year Cards feature tigers. Nyan Koi! by Sato Fujiwara. A TV anime adaptation is currently running. 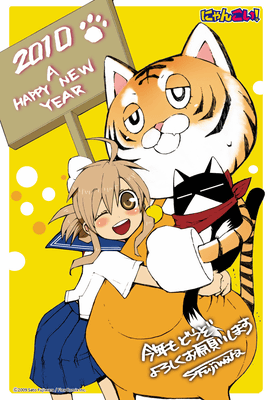 Hyakko by Haruaki Kato was also adapted to anime, aired in 2008. 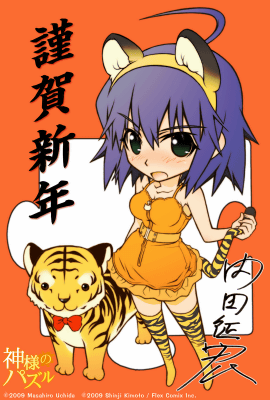 The heroine's name was Torako, which mean's "Tiger Child". Broken Blade by Yunosuke Yoshinaga is to be adapted to a six-parter anime film in 2010. Oto×Maho. The girls holding a hagoita paddle to play Hanetsuki(Japanese traditional game similar to badminton). Sousei no Aquarion: Kokuu no Tenshi, manga adaptation of the anime series Genesis of Aquarion. Vampire Princess by Narumi Kakinouchi. As a free web magazine, FlexComix mostly introduce works of up-and-coming manga artists but there are some established, well-known artists contributing as well. Kakinouchi is one of them. You can see more on the website. 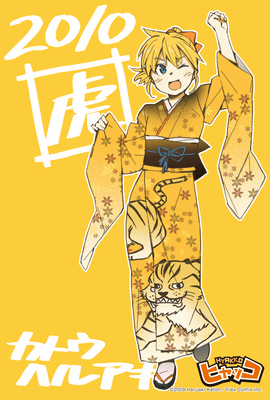 The cards will be available until February 1, 2010. Don't miss it!